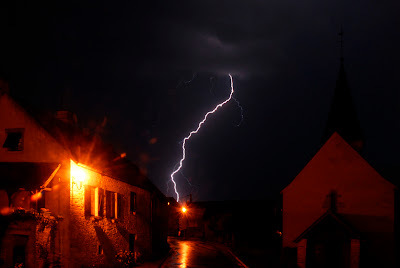 Last night we had another one of Burgundy’s spectacular thunder and lightening storms. Chris Wright, who is staying with his wife and their adorable two year old daughter Hannah at La Maison des Deux Clochers took these amazing photos out of the window. 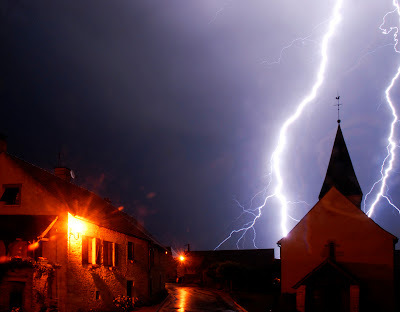 At our house in Villers-la-Faye Franck had unplugged every single electrical appliance and while Camille sawed logs in her own bed, Charlotte had hopped into bed between Franck and I and the three of us watched the show out our bedroom window. It was scary and beautiful, and made me feel very glad for being tucked up nice and safe in my bed! It was good that it happened last night as tonight is “La Fete de la Musique” which is being held at Chaux with a live band and merguez on the BBQ until late, late, late – it is the solstice after all! However, still no french door opening permission from the architect of the French Monuments. Luckily, as you can see, we have lots of distractions!